▶ SoldThis listing was sold on Oct 25, 2017 for the price shown here. 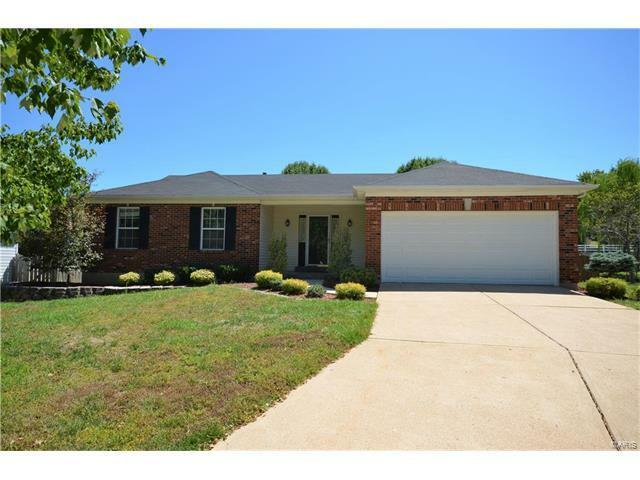 Beautiful well maintained ranch style home w/finished basement. Hardwood entry foyer opens to spacious Vaulted Great Room w/wall of windows for a bright and airy feel. Eat in Kitchen w/Hardwood floors, center island and 42 inch custom cabinets. Main Level Laundry room. 3 bedrooms on main level, Master Bedroom Suite w/ walk in closet. Master Bathroom completely updated tastefully w/new flooring, Ceramic tile shower surround and new Vanity. Full updated guest bath flanked by other bedrooms. Finished basement w/ separate recreation room. Large family area with a complete bar area great for living and entertaining. Full bathroom in basement completes this great use of living space & Plenty of storage left over. Exterior brick & vinyl siding elevation w/enclosed soffit & fascia. Large backyard and patio complete with privacy fence. Located on a Cul-de-sac. Landscaping updated, entire outside power washed, carpets cleaned, and walls touched up all ready for new owners! See it today!! Hwy 94 to right on Guttermuth to left on Clydesdale to first left on Saddlehorn. House is on left in cul de sac.